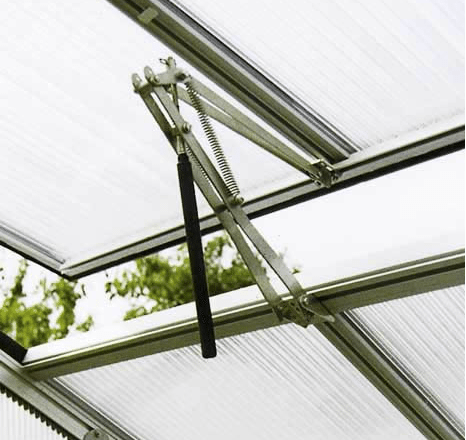 Cool down your Riga model greenhouse with the Riga Automatic Roof Window Opener. It uses paraffin oil inside the piston which expands at 72 degrees. Cool down your Riga model greenhouse with the Riga Automatic Roof Window Opener. It uses paraffin oil inside the piston which begins to expand at 72 degrees Fahrenheit for an easy way to ventilate and cool the inside temperature of your Riga Greenhouse. The opener comes with a quick release arm to make it easily disconnected in adverse weather.